Once upon a time in ancient Rome, the Colosseum was a grand and majestic amphitheatre in its glory days. But inside this beauty was an arena of massacre and slaughter on a scale so big that the grounds were soaked with blood nearly every day. Visiting the Colosseum will leave you with chills as you stand inside imagining the horrors that had taken place there. Yet thousands of tourists still flock to visit Rome’s Colosseum. 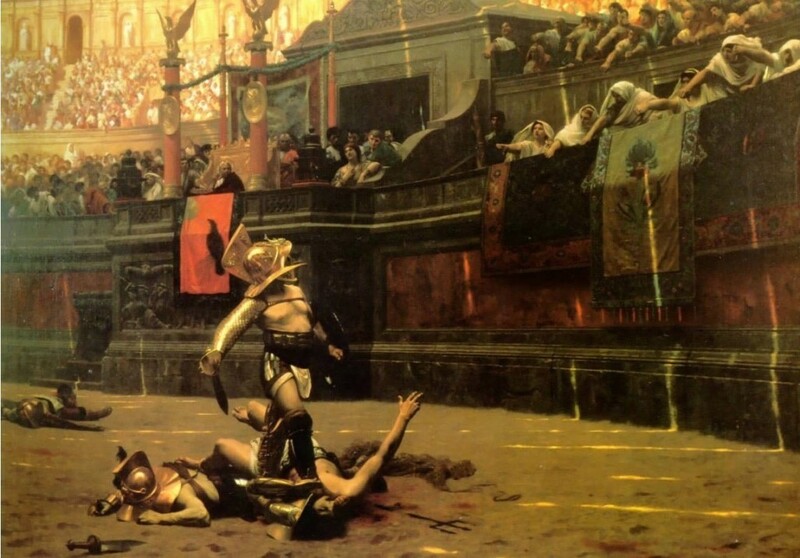 Let’s plunge into the history of the Colosseum to discover more of Rome’s cruellest sport and what drove these games. The Rome Colosseum is also known as Coliseum and the Flavian Amphitheatre. It’s the largest freestanding amphitheatre built in Rome. Gladiator is Latin for ‘swordsman’. Despite a gladiator’s origins, they were celebrated and valued entertainers who inspired the masses. Once, a section of the crowd had been selected and thrown to wild beasts in the arena because of a shortage of criminals. On Good Fridays, Stations of the Cross called the Scriptural Way of the Cross is performed by the Pope in the Colosseum. Roman Catholic Ceremonies also take place in the amphitheatre. Not everyone was allowed to attend the shows in the Colosseum. Exempt people included gravediggers and previous gladiators. Excavations of the underground below the arena began in 1810 but it was under Mussolini that it was exposed in the 1930s. Rome’s Colosseum was once an arena for gladiatorial combats, wild animal fights including gladiators, hunting games and even naval combat in which the arena was filled with 1 metre deep water. Combatants were mainly male but there had been some females throughout the Colosseum’s time as well. Gladiators were made up of slaves, condemned prisoners or prisoners of war. Rarely, combatants were given the chance to win their freedom but most combats ended in death. This was Rome’s idea of entertainment which thousands of people in Roman society had enjoyed on a daily basis. Deadly games and battles took place one after the other inside the gladiator Colosseum and when the sandy ground got soaked with blood, a new layer of sand would go on and the entertainment would continue. However, these public executions also intended to instil fear yet courage in people. The idea was to discourage crimes and disorder through an atmosphere of violence which became a part of Roman culture. Constructed from brick-faced concrete, limestone and sand, the size of this Roman Colosseum is enormous. This elliptical structure measures 188 metres in length and 156 metres in width with a base area of 24000 square metres. The outer wall’s height stands tall at 48 metres. A fence surrounded the arena with seating fitted safely away at a distance. The arena itself measured 83×48 metres. Designed with 80 arched entrances combined with many more arches, vaults, passages and stairways, the idea was to enable spectators to easily get in to watch the bloody games. 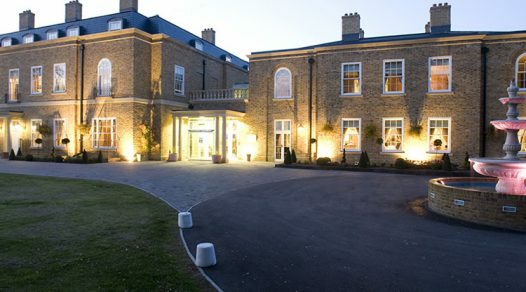 Two of the entrances were reserved for the Roman emperor, show presenters and other grand people. Rome’s Colosseum held over 50,000 spectators. Underneath the surface of the arena was the Hypogeum which was basically a vast network of underground tunnels, passageways and chambers for animals and combatants on two levels. 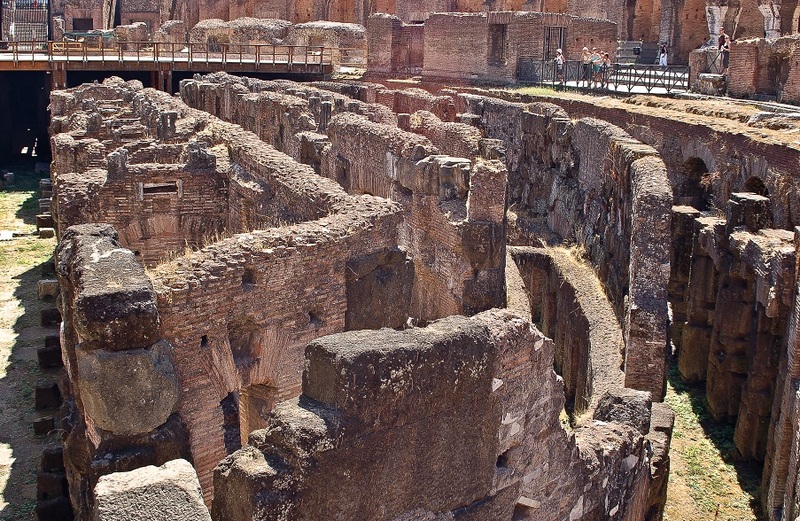 These tunnels also connected to buildings outside the Colosseum to barracks, storerooms and training rooms. Dead bodies were often transported through the tunnels to outbuildings where they were kept. Mechanical devices such as elevators and pulleys were used to raise and lower props and animals through any of the 36 trapdoors in the arena. A wild animal would usually be raised from below to join in fights. Being underground meant there had been no lighting so it must have been pretty hot especially with candles constantly burning. For combatants who were kept in these chambers, the stench must have been overwhelming with blood, dead bodies and animal waste. 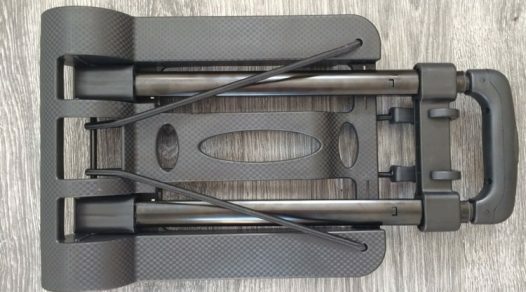 There were 4 levels of seating intended for different ranks in society. For example, on the first level closest to the arena, the seats were bigger and there were grand decorations such as polished marble walls, fountains and seats. This level was for higher class and wealthy citizens such as nobles. The emperor had his own entrance that led to the imperial box. Situated in Italy’s capital, Rome, visiting the Colosseum is on most people’s ‘Things to do in Rome’ list when they visit Rome. Other popular Rome tourist attractions include the Pantheon, Trevi Fountain, the Arch of Constantine and Roman Forum. 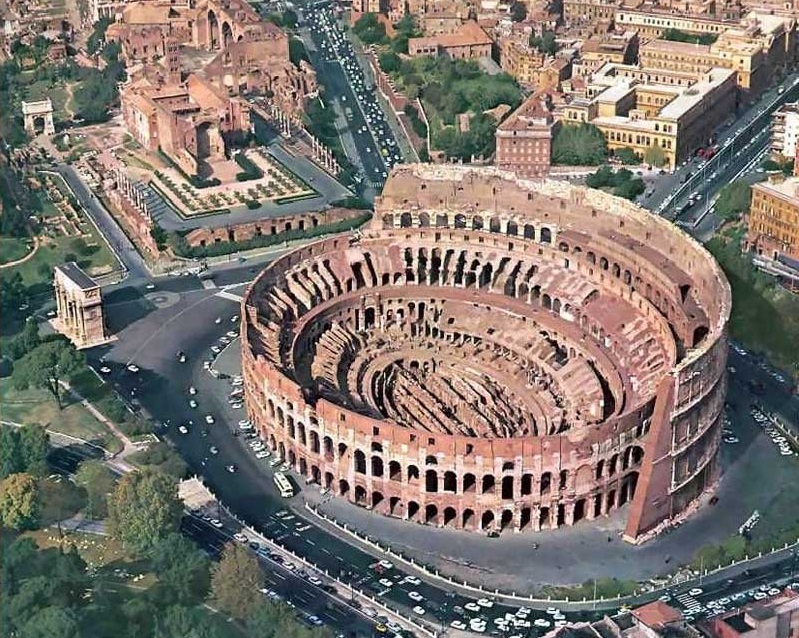 Construction of the Roman Colosseum began in 72 AD but it took almost a decade to build it. It wasn’t completed until 80 AD but this was fairly quick at the time considering the size of the amphitheatre. This one was unlike any other amphitheatre built during the Roman times as others required support whereas the Colosseum is a freestanding structure. Shortly after, the Hypogeum and a top tier was added. The Hypogeum was restructured throughout the time of the Colosseum to ensure it was up to date in technology to ensure performances continued smoothly. How Long Did The Colosseum Last? 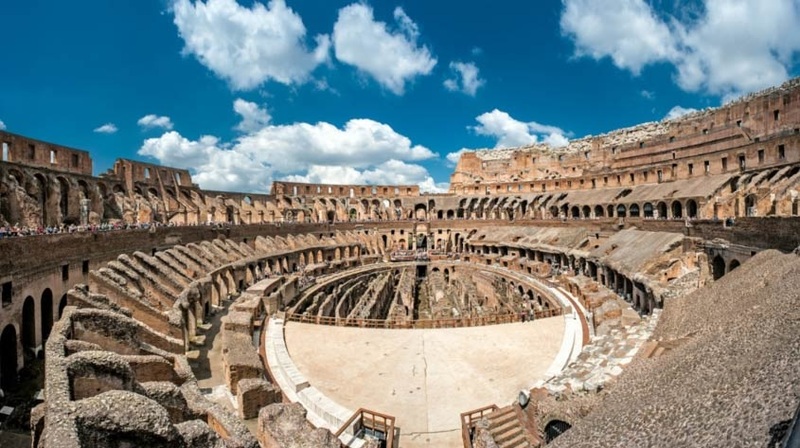 From the day it opened, games and battles continued within the Colosseum for 400 years until the arrival of Christianity which changed the morals and values of Roman culture. Gladiator battles stopped around 404 AD but hunting games continued until 523 AD. After, the Colosseum was used for housing, workshops and religious purposes. 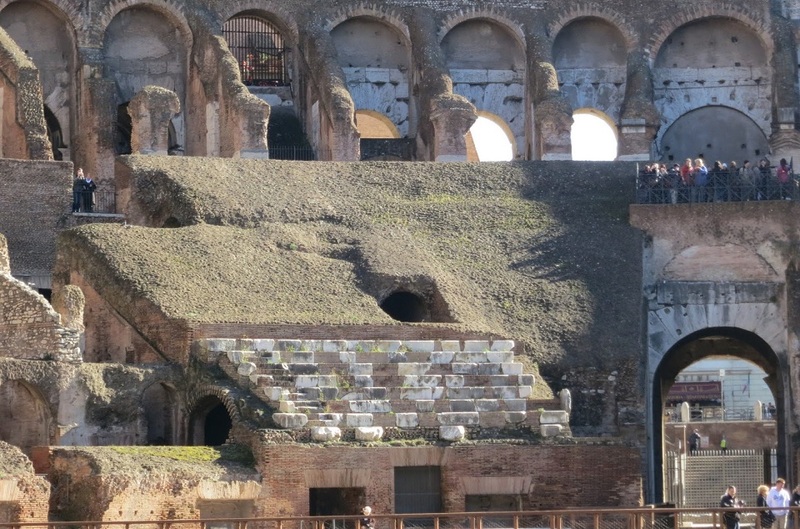 Overtime, environmental changes and earthquakes destroyed parts of the Colosseum. The worst earthquake was in 1349 which caused severe damage to one side of the amphitheatre. In addition, materials were stolen or taken for use in the construction of other buildings. 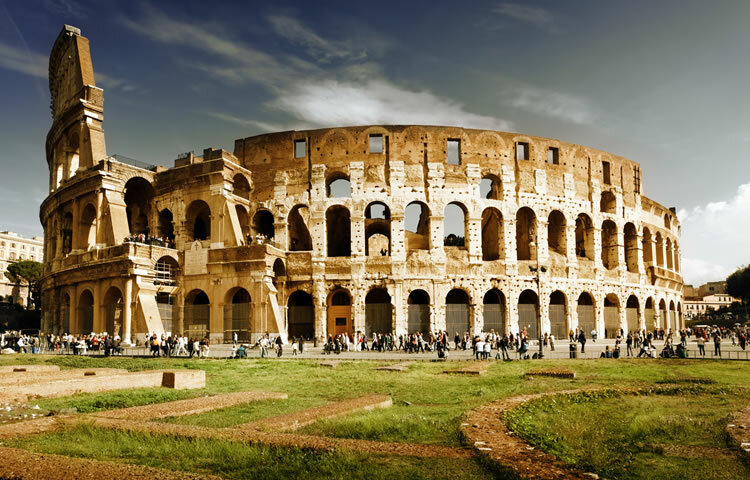 Eventually, in 1749, Pope Benedict XIV declared the Colosseum to be a sacred site and forbid further violation to the structure because it was where early Christians had been martyred. Since then, restorations began and today, after 1946 years, most of it still stands as an iconic symbol of Roman culture and power. Who Built The Colosseum and Why? Emperor Vespasian ordered the building of the Colosseum in 72 AD and he had a limitless workforce at his beck and call to do this. These workers were actually the 100,000 slaves captured after the Jewish war who were used to carry out the hard manual tasks required in the construction. Tasks that required skills such as decorating and building fell to professional Romans. Before the Colosseum was completed, Vespasian died in 79 AD and his son and successor, Titus, took over. 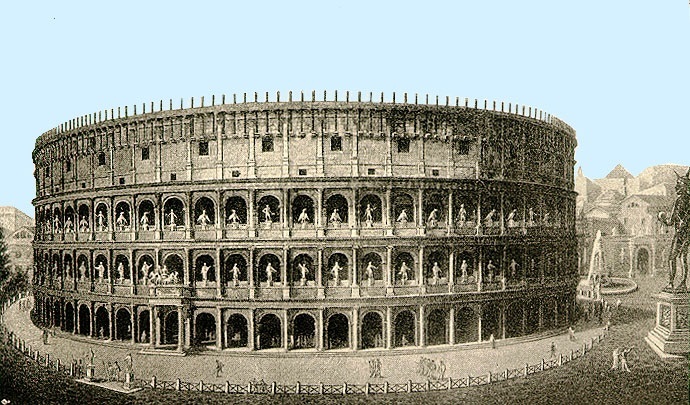 With the completions and opening of the Colosseum in 80 AD, inauguration games were held for 100 days. During this period, an estimated 9000 wild animals were slaughtered. Previous Emperor Nero who had reigned before Vespasian had been despised by the Roman people due to his poor ruling of Rome. Vespasian didn’t want the people to associate him with Nero so he destroyed the Golden Palace that Nero had built for himself. The land was returned to the people by building an amphitheatre there. Vespasian’s aim was to gain popularity with the people through gladiatorial battles and violent games as entertainment in the Colosseum. Travelling to the Rome Colosseum is fairly easy due to its location in an easily reachable and busy area of Rome. 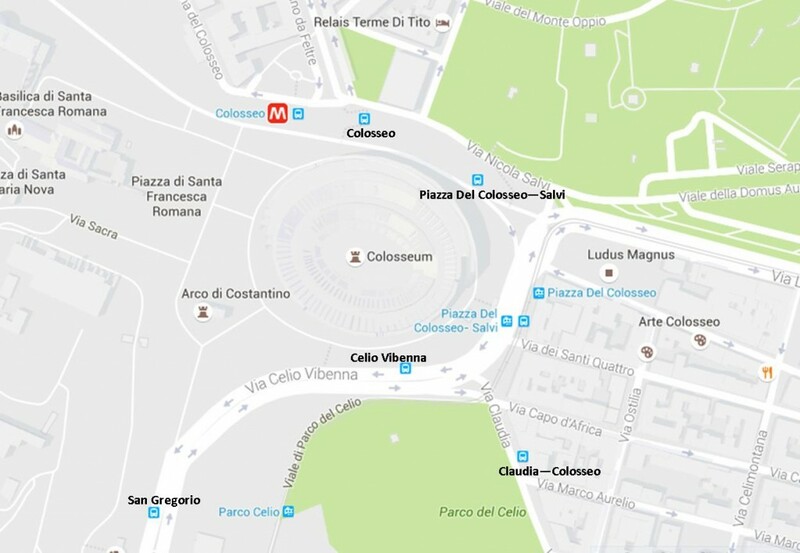 By Rome’s metro line, you can travel on line B to the nearest stop which is Colosseo and then it’s a 5 minute walk to the amphitheatre. There are several buses that can be taken which are lines 75, 81, 673, 175 and 204 with various stops around the Colosseum. Another option is the tram with line 3 that takes you to Piazza Del Colosseo – pretty much right outside. There are some hotels near the Colosseum which is within walking distance. The only days the Colosseum is shut is 1st January and 25th December. Queues at the ticket office on site can get fairly busy so it may be a better idea to buy your Colosseum tickets on the website instead but there’s a 2 Euro reservation fee included. However, for safety reasons, a maximum of 3000 visitors can only enter the Colosseum at a time despite having pre-booked tickets so it’s best you get there as early as possible. Tickets are combined to allow entry to the Colosseum, Roman Forum and Palatine which is valid for 2 days. There are other combination tickets available as well which gives access to other Rome tourist attractions. On the first Sunday of every month, there are free Rome Colosseum tickets to anyone under 18 years of age. Colosseum underground tour – Combined with the Colosseum and third ring tours, visitors will be given a guided tour of the Hypogeum in English, Spanish or Italian for just 9 Euros. Audio-visual tour – For 6 Euros, visitors can learn the Colosseum history with the supplied iPod Touch with reconstructions and narrations. Audio guide – Visitors can listen to the Colosseum’s story through dedicated listening points in their own language for 5,50 Euros. Throughout Rome, there are also other guided tours available which are ideal for people looking for a more in depth guide to Rome. Otherwise, it’s pretty easy to explore the Colosseum alone. Summer is the busiest time in Rome so visiting the Colosseum during this time won’t be so great due to long queues, delays in entering the amphitheatre and hot weather. Most places in Rome would also be shut or operate limited hours during August as well as this is the time Romans usually have their holidays. 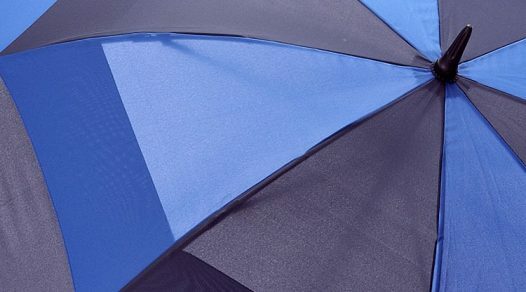 September and October is usually a good time to visit the Colosseum as the weather is milder but there aren’t so many discounts and offers available. November and February are the rainy or chilly months of Rome but as there aren’t so many tourists around, it’s the perfect time to visit Rome because the Colosseum will be pretty empty which gives you a chance to explore without delays and big crowds.